Ages 14 through adult.. Here is a collection of practical, easy-to-use materials, designed specifically for language-impaired adolescents and adults. The kit includes an activity manual, picture cards, word cards, and sentence completion cards. Reproducible worksheets are included. Skills emphasized include labeling and describing, matching words and pictures, answering questions, associating concepts, finishing incomplete sentences, defining words, giving explanations, and solving problems. The reproducible worksheets can be used in therapy and sent home for additional practice. 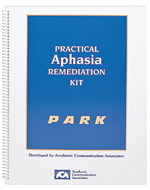 The lessons are great for clients with auditory comprehension and word retrieval difficulties. This edition of PARK includes a manual, picture cards, and sentence completion cards. Activity pages may be reproduced from the manual.